Today we’re making Vegan Chilaquiles. Now if you’ve never heard of Chilaquiles, don’t worry….because as of last week I hadn’t either. But let me just say it’s a traditional Mexican recipe and they ARE ….if I can remember my High School Spanish correctly…. Ok…now truth be told, I learned about Chilaquiles only last week when I just happened to come across THIS guy on YouTube…..meet Sam the Cooking Guy. I think I’ve got a little man crush on this dude! I mean he’s flipping hilarious! And I REALLY dig the whole concept of his cooking show. Absolutely love it! Now I’ve been thinking a lot about what’s next for BNV…..waddya think? Think I could pull something like this off? 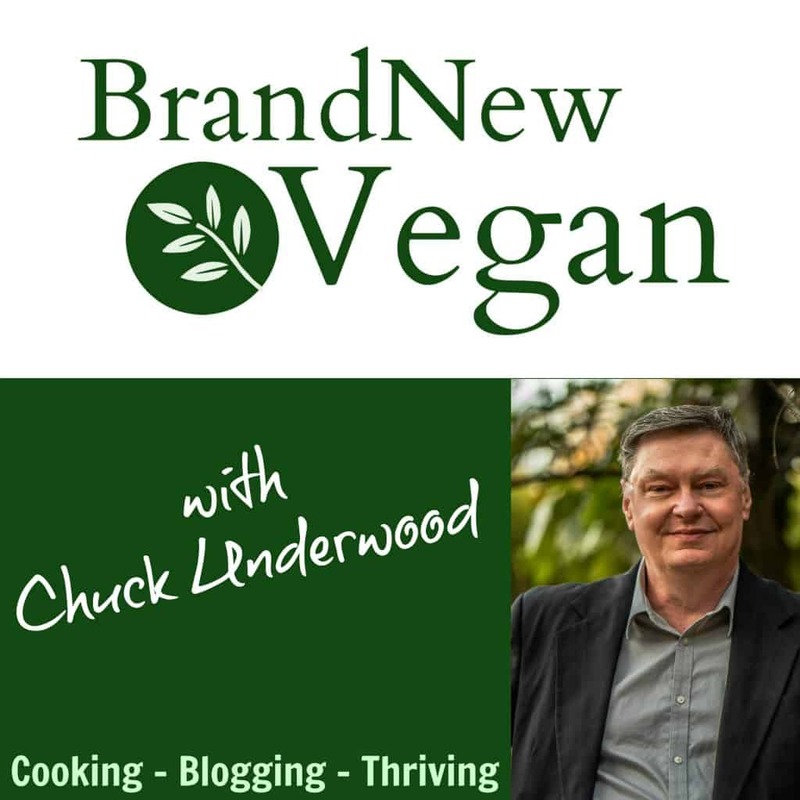 Chuck the Vegan Guy? I think it sounds like a blast! Anyways…..he made these things called Chilaquiles and I KNEW I was going to have to try them. So my recipe is based loosely on his. Thanks for the inspiration Sam. So what the heck are Chilaquiles? Think of a Mexican Casserole, centered mainly on leftover stale tortillas. Add some salsa, some fresh queso, maybe some leftovers from the previous nights dinner….toss the whole thing in the oven, and this would be breakfast. 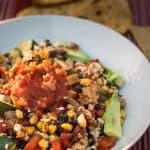 I used a fresh Salsa Verde I made in the afternoon from roasted Tomatillos, and I used a modified version of THIS recipe I found from vegan YouTube blogger Susy Languren for my vegan Queso Fresco. While it was a bit of work, especially prepping the various recipes, I will say that it was delicious and I can definitely see myself making this again. Let’s start with the Salsa Verde. You can make this beforehand and let it chill in the fridge until you need it. You’ll need 10 Tomatillos (wiki). Tomatillos are those tomato-looking things you see in your produce department with the papery skins on them. You want to peel off that husk and then wash the slimy, sticky residue off each one. Place these on a parchment lined cookie sheet along with 4 cloves of garlic (leave the skins on), and 1 or 2 cleaned, deseeded jalapeños. We’re going to broil these for a few minutes, just until the skins blacken and the tomatoes soften. I used my Toaster Oven, and it took about 10 minutes or so, flipping the veggies halfway through. Once the veggies have roasted, remove the skins from the roasted garlic (mmmmm) and carefully toss everything into your blender. Add ¼ cup of packed Cilantro, 2 Tbs Lime, 1 tsp of Mexican Oregano, ¼ tsp Salt, and 1 Chipotle Pepper with a little adobo sauce. Blend until smooth, then stir in ½ cup of diced, white onion. Now I have seen jars of Salsa Verde sold in the grocery store. I’ve never bought them, so I have no idea what all is in it. I personally would rather make it myself, but if time is a big factor in your cooking (or not) …. it is an option. This recipe can also be made ahead of time, which I highly recommend. Take a 14oz block of organic, extra firm Tofu – and cut it in half so you have 2 thin blocks of Tofu. Don’t cut in lengthwise, or widthwise, but cut it in half ‘height’ wise…… I hope that makes sense. It will make it easier to press and drain because we do not want ANY moisture left in the Tofu. Place the Tofu blocks on some paper towels, cover with more paper towels, and place something heavy on top…like a wooden cutting board. Then place a pan or something heavy on that. Let the tofu sit for a good 20 minutes. When it’s good and dry, crumble the Tofu into a bowl. Now just stir in ¾ salt, 4 tsp Apple Cider Vinegar, 2 Tbs Lime Juice, 1 Tbs Nutritional Yeast, and ¼ tsp Garlic Powder. Stir that up good and adjust any seasoning if needed. As far as I know, there is no vegan version of Queso Fresco available in the store. But again, if time is a restraint – and you happen to have some of my leftover Cheese Sauce in your fridge….might be another option. In the Video….Sam the Cooking Guy uses regular store-bought bags of Tortilla Chips. We all know they are full of salt and oil. So… you can take oil-free Corn Tortillas and bake them into chips yourself. Or you could just cut them into triangles and use them soft….whatever works for you. 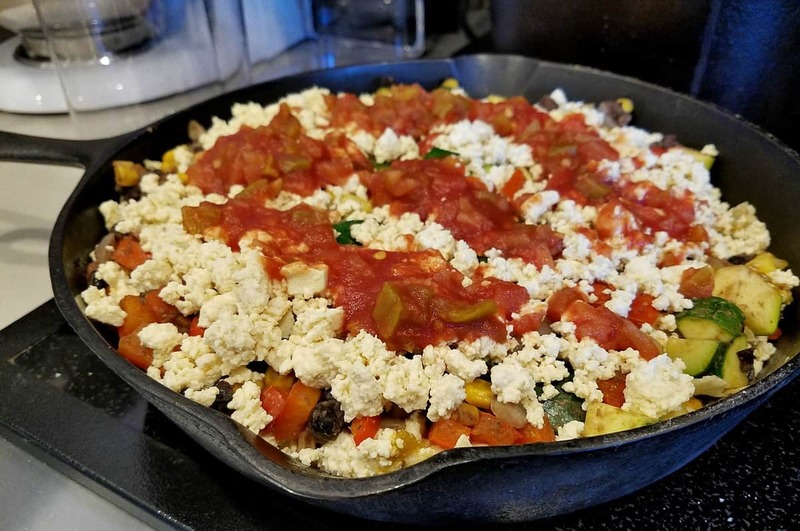 For my Chilaquiles I used ½ diced Red Bell Pepper, ½ diced White Onion, 1 cup of Corn (I found nonGMO Fire Roasted by DelMonte), and 1 cup of drained Black Beans. Sauté the veggies until softened, then add the corn, and finally the beans. While the veggies are simmering, dice 2 small Zucchini and stir them in as well. I love this mixture! So colorful! Red, Green, Yellow, White, a little Black from the beans…… beautiful. Season with ½ tsp Cumin, ½ tsp Garlic Powder, and a dash of Cayenne if you want a little zing. To assemble your Chilaquiles…… law down a layer of Salsa Verde in an oven proof pan. I used my cast iron skillet. Then, add some crumbled up Tortilla Chips, then a layer of veggies, and top if off with some Queso Fresco. Repeat with the remaining Salsa Verde, more chips, the last of the veggies, and some more Queso. Top with a few tablespoons of your favorite Salsa and bake in a 400° F oven for about 15-20 minutes. Garnish with fresh Cilantro, Lime Wedges, a little Avocado, and maybe a dollop of my famous Green Chile Sour Cream. 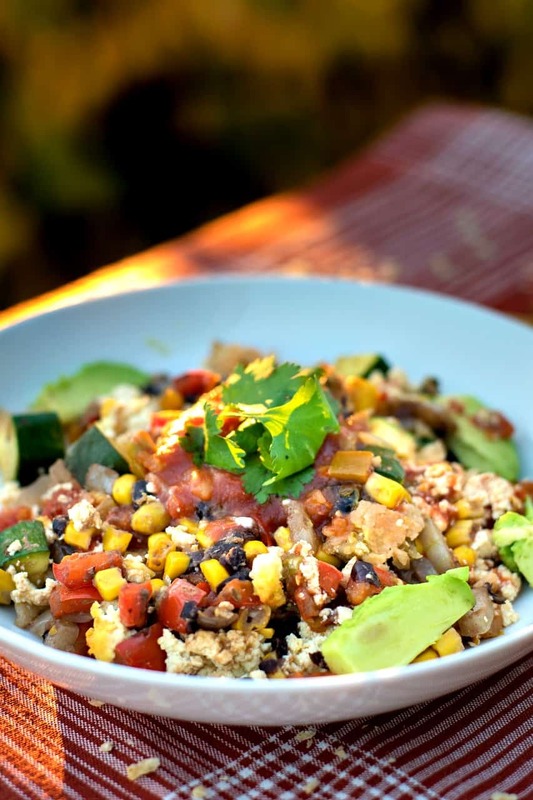 Chilaquiles are traditionally enjoyed for breakfast in Mexico. I made them healthier by using fresh Salsa Verde, Tofu Queso, Corn Tortillas, & Veggies. Remove husks from Tomatillos and clean. Place on parchment lined cookie sheet along with whole garlic cloves (with skin), and the cleaned Jalapeño. Broil for 10 minutes or so - just until the veggies blacken and soften a little. Flip the veggies over after 5 minutes or so. Add the roasted veggies to your blender along with all the remaining ingredients except the onion. Blend until smooth and stir in the diced onion last. Cut Tofu into 2 small thin blocks and press with paper towels until thoroughly drained and dry. About 20 minutes. Crumble Tofu into small bowl and stir in remaining ingredients. Saute onion and bell pepper until softened. Then stir in corn and beans. Let simmer for 5 minutes or so and then stir in diced Zucchini. Add remaining seasonings and allow to simmer an additional 10 minutes. Cut tortillas into quarters and bake in oven until crisp. In an oven proof pan or casserole dish, lay down a thin layer of Salsa Verde to completely cover bottom. Cover with crumpled up tortilla chips. 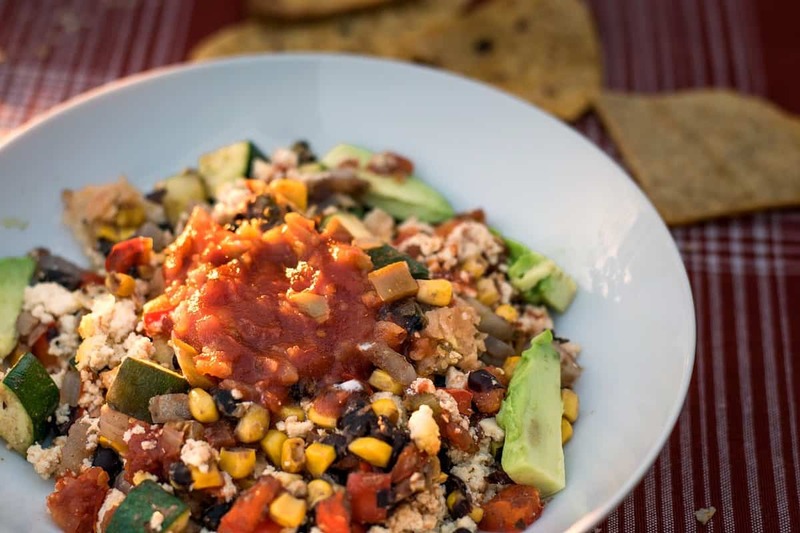 Add layer of Veggies, topped with a sprinkling of Queso Fresco. Repeat with more Salsa, Chips, remaining Veggies, and another sprinkling of Queso. Top with 2-3 Tbs of your favorite Salsa and baking in a 400 degree oven for 15-20 minutes. Garnish with fresh Cilantro, Lime Wedges, additional Tortilla Chips, diced Avocado, and a dollop of my famous Green Chile Sour Cream. oh! YUM!!!!!! Great photos, too! Looks amazing… I’ll definitely try this.. Was just wondering if it would have to be eaten, right away? or do you think I could make it and pack any leftovers in lunches to be warmed up later. ?